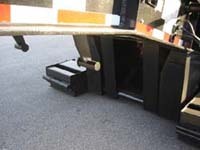 The cylinder pushes off the ground which lifts up the trailer so you can release the pressure to remove the steel blocks. Then you can lower the trailer down to the ground and detach the gooseneck from the trailer (drive away with gooseneck on the tractor) to load your equipment onto the trailer. After you have loaded your equipment, you back up the gooseneck to the trailer to reattach the gooseneck to the trailer and secure it in place. 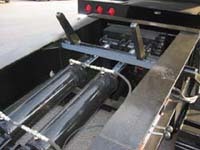 The Cylinders ( 2 ) are in the gooseneck of the trailer and pushes off the fifth wheel of the tractor lifting up the trailer so you can release the pressure to release the pin (air operated) and lower the trailer down to the ground. Then detach the gooseneck from the trailer (drive away with gooseneck on the tractor) to load your equipment onto the trailer. After you have loaded your equipment, you back up the gooseneck to the trailer to reattached the gooseneck to the trailer and secure it in place. The neck has no contact with the ground because it pushes off the tractor. The non-ground bearing neck has 5 ride heights settings (Ground Clearance is adjustable) so you can raise or lower the height of the trailer. No contact with the ground surface. 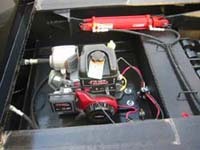 If you bottom out the trailer and you are stuck you can start the engine and raise the trailer up and go. 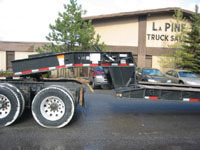 The LaPine Truck Sales & Equipment Advantage Our Lowboys are Fully Self Contained Our Lowboys offer the BEST Value to you Many trailer options and upgrades Unbeatable Prices,Fast delivery. Please consult an expert LaPine professional today to review all of your options to save time and money. We can build a trailer to your requirements in the fastest time frame and with our large buying power we can past the saving to you. Our Large inventory of Trailers are spec with all types of options to meet our customers requirements for immediate delivery. And we can build your trailer in less time because we have over (50) trailers in our production line.